There is nothing better than coming home to your sweet doggie greeting you at the door, am I right??? We want to make sure our pups have the best nutrition, so why not give your favorite pooch some grain free dog cookies made with chicken and sweet potato! Not only will your pup appreciate devouring the yummy cookie, but you can also feel good about giving your dog a treat that is loaded with healthy ingredients. Why Should I Feed My Dog Homemade Grain Free Dog Treats? When you make this DIY dog treats recipe, you can monitor exactly what you put in it so you know that your dog is eating something healthy. It is important for them to eat healthy, just like humans, to have a long and enjoyable life. Having said that, I think it goes without saying that if your dog is sensitive or has allergies towards chicken, eggs, dairy and/or sweet potato, this recipe might not be for your pup. (Or there are vegan replacements that you can substitute for some of the ingredients). So, we all know that buying treats at the store may seem like a quick and simple idea, but if you aren’t sure what you are buying it could lead to troubles down the road. Many brands use grains that are grown using contaminants and chemicals that aren’t good for your pup and should be avoided. If your dog has any sort of grain allergy, you don’t want to risk cross-contamination. If allergic, grains can affect your dog’s skin, causing itching, hot spots, and hair loss in patches. Also, because grains are not a natural part of a dogs diet, eating them can cause stomach upset. Making these DIY dog treats can help ensure better digestion and a healthier dog overall. 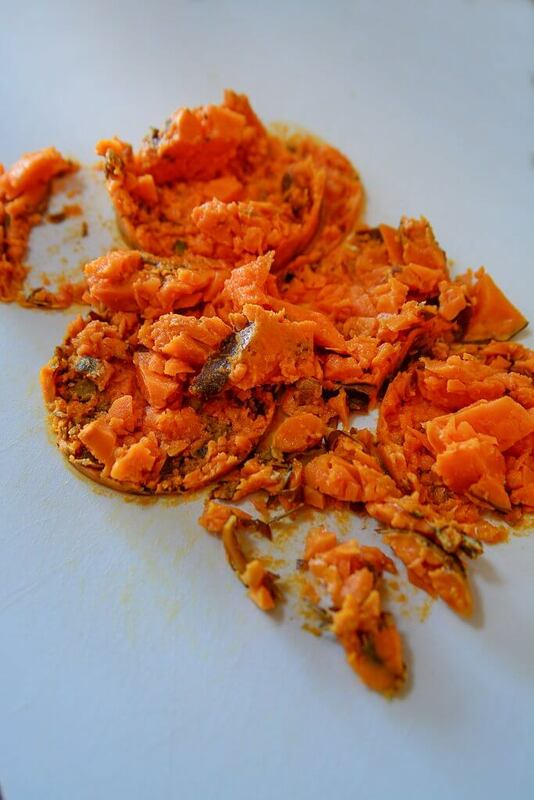 What Makes DIY Sweet Potato Dog Treats Healthy? 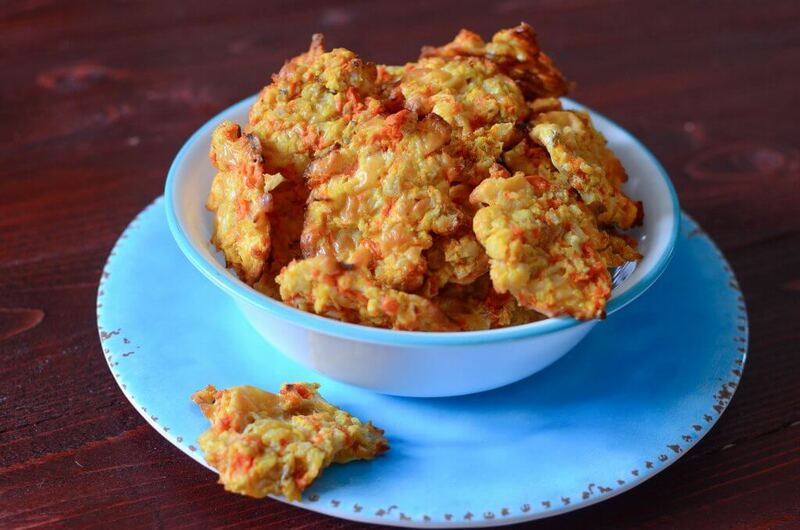 There are so many tasty and scrumptious nutrients in these DIY sweet potato dog treats! As you can see, there are so many healthy nutrients per dog cookie that you can feel good about giving them as treats without added grains. Turkey – Let’s face it, dogs love meat and turkey is always a winner! Pumpkin – Just like humans, there is something delicious about the flavor of pumpkin to a dog! Apples – Add in a few sweet apples and your pup is going to go crazy for it! Salmon – Very few dogs can resist the delicious flavor and smell of cooked salmon. Give it a try! What Ingredients Should I Never Give My Dog? Dog cookies are actually pretty simple to make and the directions are straightforward. 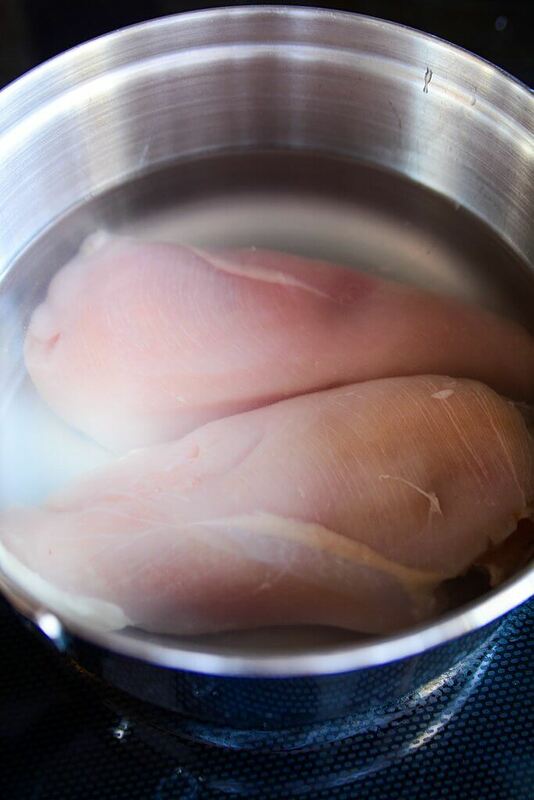 To start you will want to start with cooked chicken. I poached two chicken breasts and when they were cool, I minced them until very fine. If you have a food processor that is the easiest and fastest way to do it. Leave the skin on the cooked sweet potato and mash it up. 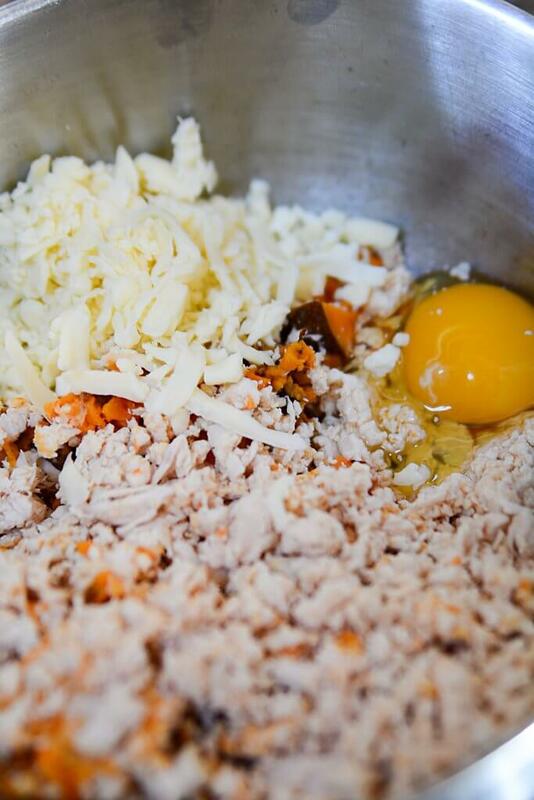 In a mixing bowl, add the egg, mozzarella cheese, sweet potato, and minced chicken breast. Mix all the ingredients well, you don’t want any big chunks. ** In this photo above you can see that I only added one egg, but in making the recipe, I eventually ended up adding two eggs just for a better binding factor for the dog cookies. After you mix the cookie dough, scoop it and place them onto a baking sheet that has been lined with parchment paper. Thin them until they are no bigger than ¼” in depth. Next, make them for 20-25 minutes at 350 degrees F. Keep an eye on them so they don’t burn. Each oven will vary, but after the baking time is up, you will need to turn the temperature down as low as it can go and continue to dehydrate the dog cookies for 4-5 hours. Mine went down to 110 degrees, however, the hotter the oven, the less amount of time you’ll need to completely dry the dog treats. Turn them halfway through drying. If you are using a convection oven to dehydrate the dog treat cookies, then getting the air to move and dry them will be very easy. If you don’t have a convection oven, I have found the easiest way to dehydrate them is to open the oven door to allow air circulation. This will shorten the dehydrating time. Just make sure that there are no pets or children that get near the open oven door. Store the dog cookies in the fridge in an airtight container for approximately two weeks. You can keep them in the freezer for up to a month. Remember, always keep an eye on your pup to make sure there aren’t any ingredients that he has an allergy to. 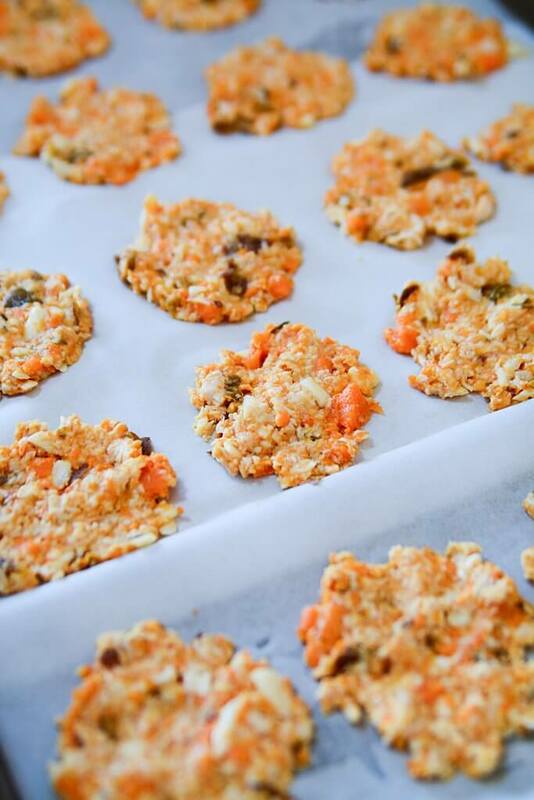 All that is left is for your adorable hound to devour these healthy dog treats! 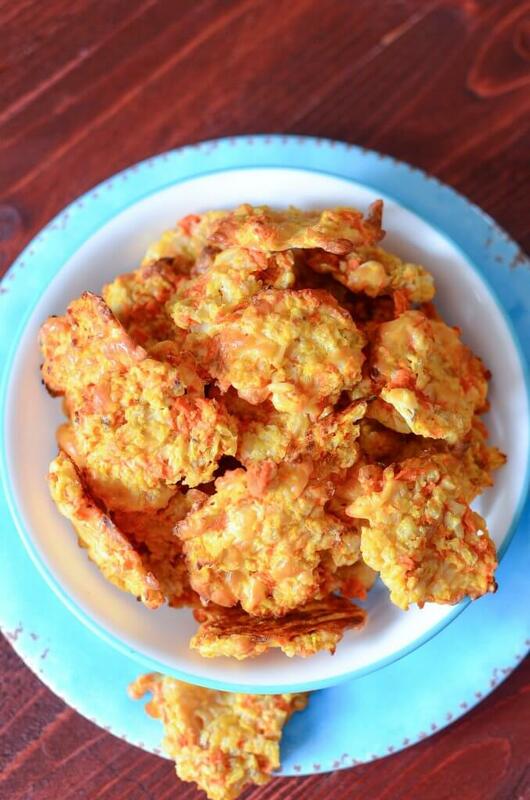 I hope you enjoy this easy recipe for DIY Chicken and Sweet Potato Dog Treats! It’s always fun to watch our fur babes enjoy the treats we make for them. If you’re looking for more dog treat ideas, take a peek at this roundup of a few recipes of other DIY Dog Treats I put together! Also, if your pup is diabetic, check out this roundup of special, diabetic dog treats that are good for pups! Thanks so much for taking a look at this recipe today, and I hope to see you again here at The Salty Pot! A DIY Grain Free Dog Treat that is tasty for your pooch and healthy because there are no grains involved! 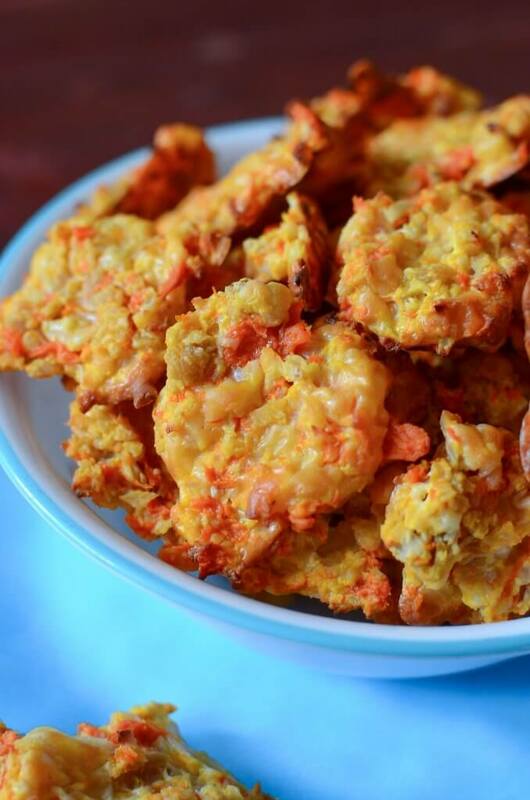 This 4 ingredient recipe comes together in a snap! Poach the chicken breasts (or use leftover chicken). When cooled, shred and/or mince into small pieces. Cook and mash a sweet potato, leaving the skin on for extra nutrition if the potato is organic. If not, peel, dice, cook and cool. Mash. Using a teaspoon, scoop a heaping teaspoon worth onto a parchment lined baking sheet. Flatten the cookies so they are a 1/4' thin. Bake in the oven for 20 - 25 minutes or until the cheese is melted and they look cooked through. Keep an eye on them so they don't burn. Turn the oven as low as possible (mine was at 110 degrees) and dehydrate for 4 - 5 hours or until they are very dry and crisp. Turn over half way through the drying time. After drying time is up, keep them in an air tight container for up to 2 weeks, or in the freezer for up to 1 month. **If you oven doesn't go as low as mine, simply put it as slow as it will go and open the oven door. This will help with the air circulation and the drying of the treats. Adjust the drying time with the oven temperature. If the oven is hotter than 110, then drying time might be less. You want the treats to be cookie like.